I'm keeping the straps on the wide side so bra straps hopefully won't be an issue while wearing. 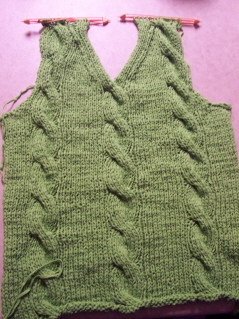 Because of where I started the armholes, the tank ended up more of a V-neck type pullover, although that can be changed easily enough. I have some more yarn like this in my stash - I'm thinking I'll make a second style in a different size, just to experiment a bit. I'm dying to start a new project, but I swear I'm going to finish Green Apples first! 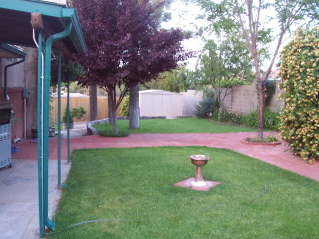 The outside cables separate, then one end twists over the middle end at the neck in an arrowhead shape, coming back to twist again before the top of the shoulder. I should have just enough room to make it happen. Hopefully, though, with enough wiggle room to make this in more than one size. That's the problem with designing something that depends on design elements happening at certain times - at times it makes adjusting for sizes nearly impossible. 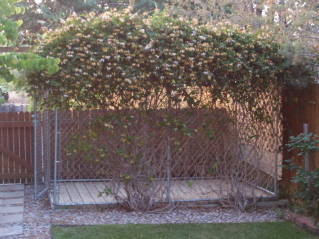 The dog run has a wooden floor, which you can see in the picture. Think a minute...a wooden floor in a DOG run. Doesn't make much sense, does it? Besides, it's not much of a "run" - more like a "sit & bark!" 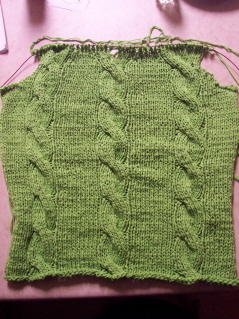 Tomorrow I'll have the front of Green Apples finished - not sure yet if I'll do cables on the back or make it plain. 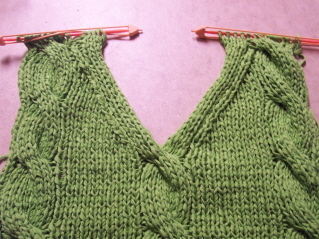 Right now I'm leaning toward a plain back but with a V also and full-fashioned decreases around the armhole & neck. But sometimes inspiration strikes & you have to go with the flow. 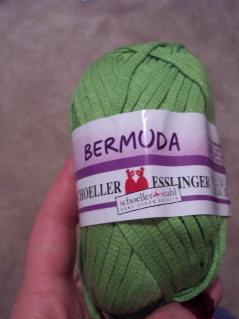 Let me introduce you to "Green Apples:"
Bermuda is exactly like this yarn except it came in nicer colors before it was discontinued. 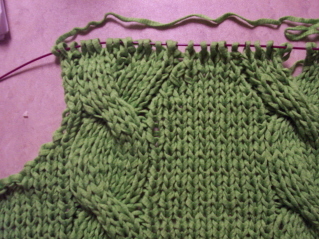 :) I'm using a size 11 needle to get the loose stitch look that I want. 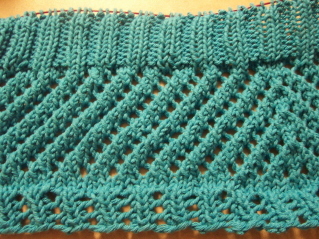 I'm going to write this pattern up so I'll need a couple of pattern testers along the way. I've had all sorts of ideas about a fancy neckline & intertwining cables, but I think I've settled on cables going up & around the straps while the middle cable splits & goes around the neck. There will also be some waist shaping. I decided that about 4" into the body. After first I was thinking of making it on the loose side, then realized that "shapeless" was not the look I wanted. 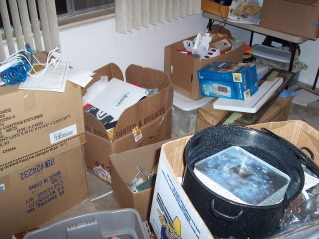 The good news is that Doug will be putting in LOTS more shelves for me. 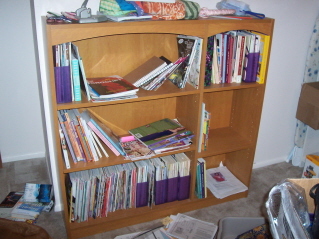 In fact, one whole wall will basically become a built-in bookcase just to house all my bits & bobs. In a few days he'll have a week off to take care of some things around here & at the old house so I'll have to put my shelves on the list! 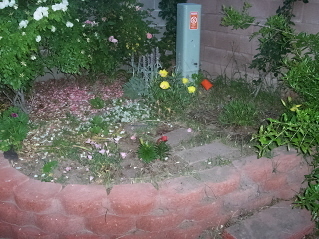 Yesterday I planted my garden - pix of that tomorrow. Luckily it's not too late to get things in, although I did buy larger tomato plants to make sure we'd get a crop this year. I found 3 rhubarb plants which I snatched up greedily. There's nothing better than rhubarb pie. 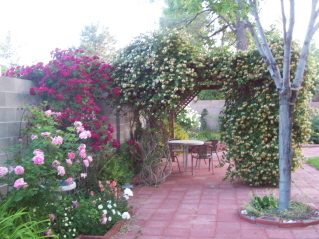 :) My Dad always had some in the garden and it reminds me of him. I also picked up some flowers for the back - Mexican Evening Primrose, Oriental Lilies, and a couple of other things whose names escape me at the moment. 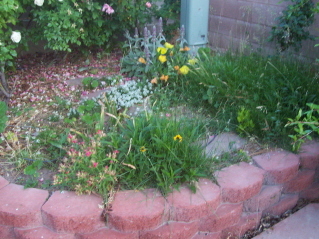 There's a patch in the corner that's been taken over by grasses. 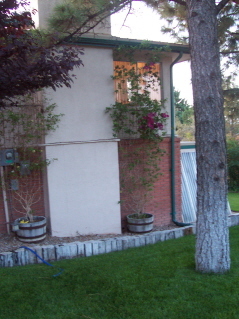 I'm going to dig that up & re-plant.